In the time I've been here, I have noticed a few distinct quirks about the US and its people, which I’m pretty sure every incoming (esp. Indian) grad student will have asked himself/herself. Now that the long weekend is upon us (and I've not got a lot of assignments), I tried to find a few answers. 1. WHY THE HELL DO AMERICANS USE THE WORD 'LIKE' SO MUCH??!!!! Every smartass on the planet thinks America's biggest problem is obesity, but in my opinion, THE biggest problem of this country, is the over-use of LIKE. This one word, I tell you, is the most obnoxious thing to hear, beating even 'Call Me Maybe' and that Skrillex thing. I believe the fine state of California, as expected, is where the harmless looking qualifier took its roots. The 'Valley girls' (affluent air-headed high-school girls in the San Fernando Valley, part of the LA area) harmlessly (and quite brainlessly) inducted this word in their slang. Not just 'like', fillers such as 'as if! 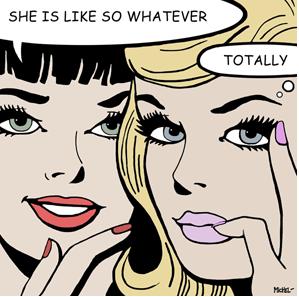 ', 'totally' and 'whatever' - words which are commonly used by many a wannabe popular college-goer even back home, are some of the wonderful gifts of these highly er, sophisticated young women to humankind. And future historians will note that the subsequent embracing of these phrases by Hollywood, what with its Lindsay Lohans, the 90210s and infinite chick flicks, ultimately led to the intellectual and cultural downfall of the human race. Hey, teenage kids using slang and colloquialisms is very common. Heck, we've all grown up with slang. We still use our 'da's and 'dude's when we talk to friends. The problem is when such slang enters the workplace or the college classroom. It's as if these kids all graduated from their snooty high schools at the same time and spread to college campuses across the country with a collective mission to devolve the college brain. Instead of intelligible, clearly articulated sentences or ideas in class, we often hear things like 'Well Professor, I think we're supposed to like address that issue first and then look into the umm, implementation'. And that's where the problem is. We'll soon have this generation graduate and move to workplaces. And unless people learn to omit such verbal clutter during important conversations, they will carry it along with them for their whole lives. Office memos and circulars may soon read 'We totally need to focus our attention on like, this one thing'. As my brilliantly articulate Professor puts it, "Umm is not a word, it's a speech defect!". So, when you use such ticks, knowingly or not, remember you're not coming across as worldly wise and intelligent, but as a verbally and intellectually defective, incoherent mind with utter lack of communication skills. 2. How did the $ sign come to be so? It's interesting how the American currency came to be called dollar, and even more interesting how the weird-looking $ symbol came to be associated with it. We Indians are still getting used to the sign that we got barely two years ago, after a contest and everything, that too. Like most things in America, my eyes have Spanish origins too! The word dollar evolved from 'daler', which was an evolution of the word 'thaler', a silver coin that was used through the Medieval Ages in Europe. And in 1792, a few years after the American War of Independence, the Spanish-influenced 'dollar' was chosen to be the United States' preferred currency over the British Pound. (Source - http://projects.exeter.ac.uk/RDavies/arian/dollar.html). 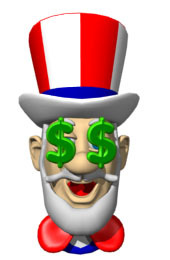 There are many versions on how the '$' sign came to be used to represent the dollar. 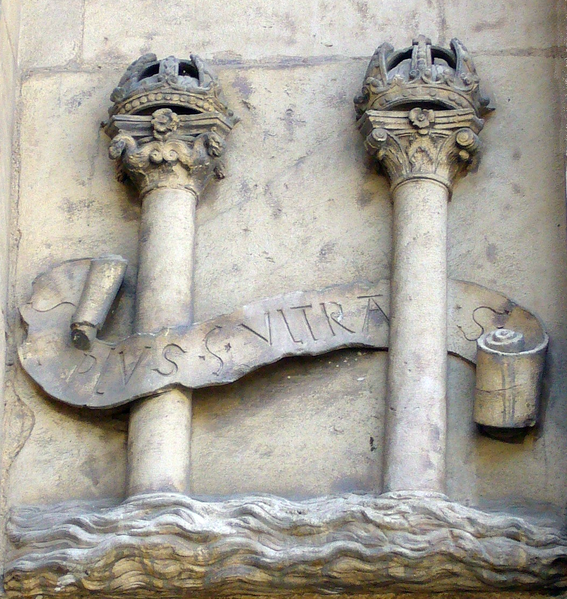 A popular hypothesis is it is derived from the Pillars of Hercules, which were part of the Coat of Arms of Charles V, who was the King of Spain following the discovery of the Americas in the 16th century. The motto inscribed on the scroll is 'Plus Ultra' meaning 'Look Beyond', referring to the discovery of the New World. Soon this 'pillar dollar' became part of the Spanish Peso and the Spanish Dollar, and eventually the American dollar that we use today. Well, that's two all-American eccentricities explained. Happy Kasab execution day everyone! You totally nailed the point, as in like slayed it !! !